Have you heard the news? New Orleans, Louisiana and the Mississippi Gulf Coast is throwing a Mardi Gras party! It’s a Louisiana lagniappe-laissez les bons temps rouler-throw me something, mister atmosphere down here, and here’s a bit of background. Carnival season begins on the 12th night of Christmas, which is also know as Epiphany. 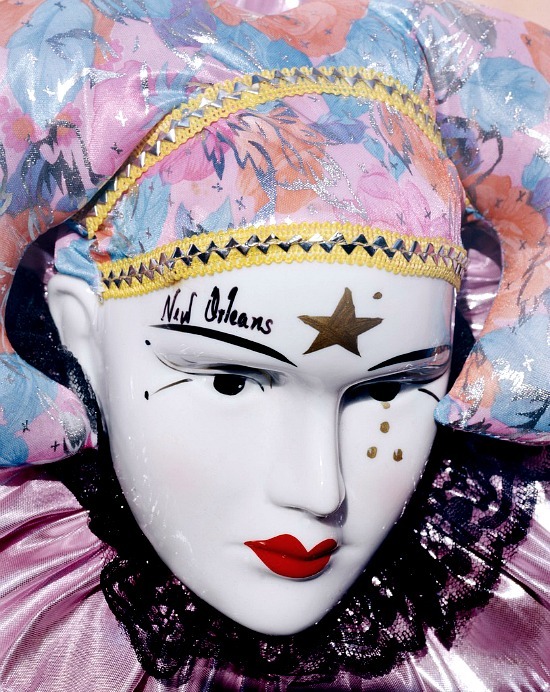 Until Ash Wednesday, ’tis the season to celebrate Mardi Gras. Revelers gather to pass a good time, attend masked balls, indulge in decadent food and drink offerings, parade party with the Krewes and carry on traditional traditions. A custom still celebrated is the King’s Cake. 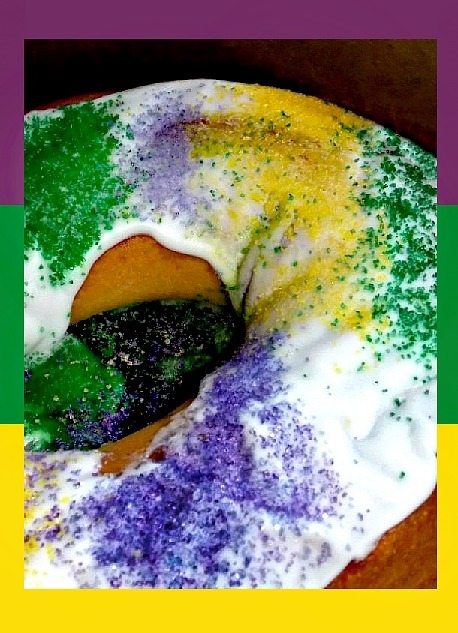 King Cakes are made of a cinnamon filled dough in the shape of a hollow circle, glazed with topping and sprinkled with sugar in the colors of Mardi Gras- purple, green and gold. 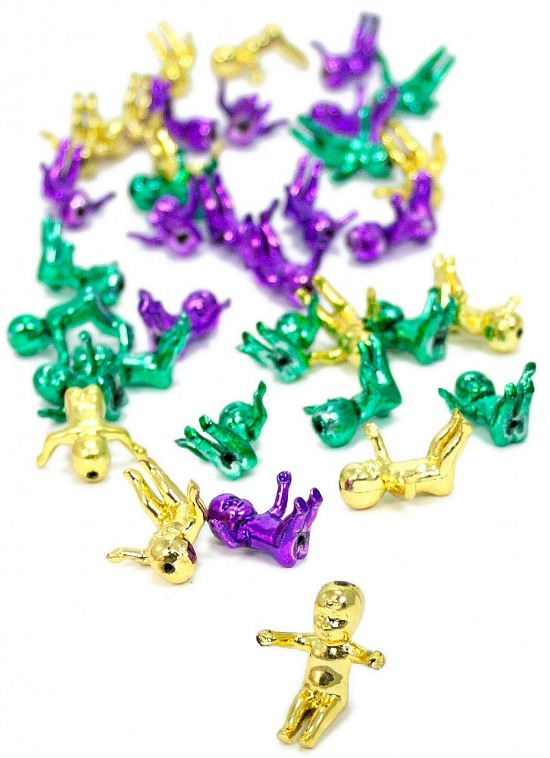 A plastic baby is baked inside the King Cake, and tradition says whoever gets the baby in their piece of cake has to buy the next King and host the next party. King Cakes are a diversified delicacy- baked, filled and decorated in different ways based on bakery, tradition and territory. Different strokes and tastes for different parishes as it goes. 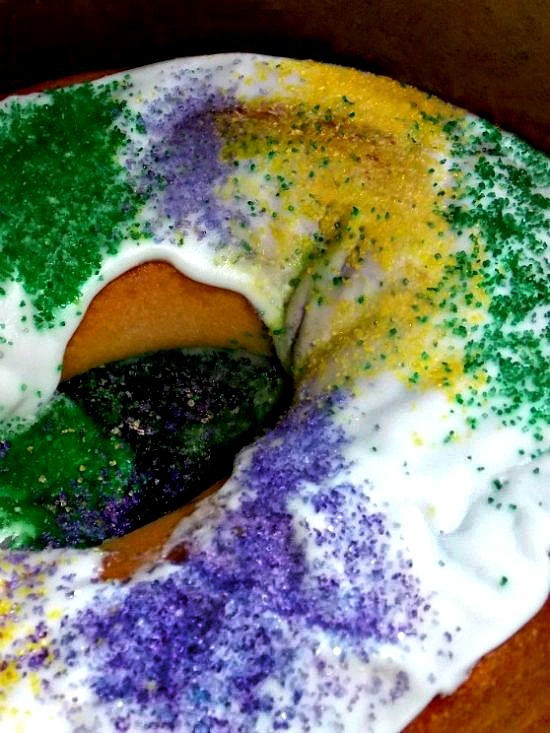 These Mardi Gras favorites are sold by the thousands during Carnival season. 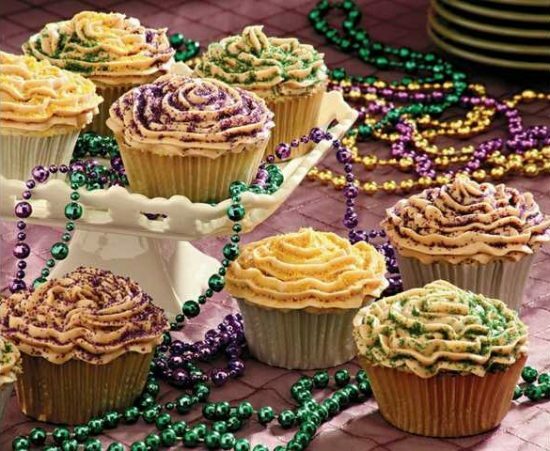 This recipe for King Cake cupcakes bakes up a little bite of Big Easy flavor in laissez les Bons temps rouler taste so good tradition. Preheat oven to 350°F. For the Cupcakes, mix flour, baking powder and salt in medium bowl. Set aside. Beat butter in large bowl with electric mixer on medium speed 30 seconds or until softened. Add granulated sugar and vanilla; beat until light and fluffy, scraping down sides of bowl frequently. Beat in eggs, 1 at a time. Alternately beat in flour mixture and milk on medium-low speed just until mixed. Spoon batter into 12 lightly greased or paper-lined muffin cups, filling each cup 2/3 full. Bake 12 to 14 minutes or until toothpick inserted into cupcake comes out clean. Cool in pans on wire rack 10 minutes. Remove from pans; cool completely. Makes 12 (1 cupcake) servings. For the Frosting, beat cream cheese and butter in large bowl with electric mixer on medium speed until smooth. Add confectioners’ sugar and extract; beat until fluffy. Set aside. Make an indentation in the center of each cupcake using the handle of a wooden spoon or a straw, making sure not to break through bottom of cupcake. Spoon Frosting into resealable plastic bag or piping bag fitted with star tip. If using plastic bag, cut a small piece off one of the bottom corners of bag. Pipe a small amount of Frosting into each cupcake. Pipe remaining Frosting onto each cupcake. Sprinkle with colored sugar, if desired. I love eating at the casino your food is out of site. I must admit Kathleen, Louisiana doesn’t get some things right but we do master the art of fantastic food, spices, & unique dishes. I will share more native Louisiana recipes down the road. Casino you say? Now that’s a combo I can get on board with- casinos & good food!